Where magnetic sea views and seamless indoor-outdoor living reign supreme. 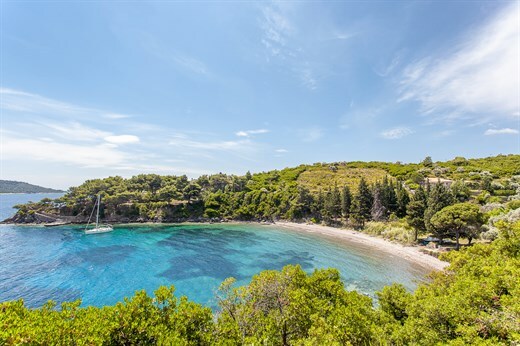 Set in a privileged panoramic position above the charming fishing village of Steni Vala, Jura combines unrivalled views out to sea, an enticing panoramic pool and easy access on foot to a quiet beach and seafront tavernas. Inside: accommodation at Jura is spread over two levels. All the rooms are designed to maximise the property's sea-view position and to provide effortless access to the outdoor areas. The main entrance to the upper floor takes one in to the bright open-plan living area and kitchen-diner. The natural flow between these areas is aided by the cornflower-blue polished concrete floor that runs throughout. The living area is furnished with contemporary pieces gathered round a stylish fireplace, while the focal point of the contemporary kitchen-diner is an antique teak Indian cupboard that doubles up as an island. Wide floor-to-ceiling glass doors in each of these areas open out onto the surrounding decked terrace and bring in the stunning views. A short corridor leads from near the kitchen to the two bedrooms on this level, a double-twin with shower room opposite, and the master double, which has its own en-suite shower room. Both bedrooms have sea views and large glass doors accessing the terrace. The remaining accommodation is on the lower floor, which is accessed externally via a flight of stone steps. Here there are two independently accessed bedrooms, a double and a twin, both with en-suite shower rooms. These bedrooms have a connecting door which can be locked or left open depending on your requirements. Both lead out to the sea-view terraces and gardens. Outside: set into the hillside above the little harbour village of Steni Vala, Jura has been designed to blend subtly into its natural context of whispering olive trees, proud Aleppo pines and Mediterranean gardens. Outdoor life at Jura revolves around the fabulous decked terrace that runs the entire length of the façade. Accessed from all the rooms on the upper level, this terrace offers mesmerising views, a choice of sitting areas and an al fresco dining area that is served by both the indoor kitchen and a barbecue. The decking extends from the house across to a rocky promontory, where, seemingly floating above the slope below, sits the inviting, uniquely shaped panoramic pool. Due to Jura's location on the island of Alonissos and the limited number of hydrofoil/ferry connections between Skiathos-Skopelos-Alonissos (which might occasionally delayed or cancelled due to bad weather), we recommend that you book your flights to arrive either the day before your stay at the villa or in the morning of your arrival day. Similarly, for departure, we recommend you book either a late flight or a flight on the day after leaving the villa. Due to the nature of this property including stairs without bannisters and drops, we do not normally accept bookings for groups including children under the age of 12. Please contact us for further information. A return taxi transfer from Skiathos airport to the port and a hydrofoil/ferry to the port on Alonissos (Patitiri) are included on the first and last day of the booking. In the unlikely event that your flight arrives in Skiathos after the last ferry/hydrofoil to Alonissos has left, a taxi from Skiathos airport to the port is included but private sea taxis are not (however, we would be happy to organise one for you where possible). In this case, the return leg from the port on Alonissos to Skiathos airport for your flight home is of course still included. Alternatively, why not arrive in style by helicopter via Athens International Airport? Find out more here. Jura sits above a lovely sandy beach about half way up Alonissos's east coast. The seafront tavernas, amenities and harbour of Steni Vala are about 5 minutes' walk away, making it eminently possible to dine out without ever taking the car. The island's main port, Patitiri, and the historic capital, Alonissos Town, are just a 20-minute drive away. Despite its diminutive size, 14km long and 4km wide, Alonissos has an embarrassment of riches when it comes to beaches. Arguably the best ones are to be found along the east coast and on the southern tip. One such, just a 10-minute drive north of Hibiscus, is Agios Dimitrios, whose splendid white sands and intense blue waters are irresistible. The north of the island also boasts some idyllic coves and beaches but most of these are only accessible by boat: an excellent reason to rent one for your stay. Alonissos, its surrounding waters and minor islands, including Peristera, Kyra Panagia, Gioura, Psathoura, Piperi and Skantzoura, form the Alonissos Marine Park, the largest of its kind in Europe. Established in 1992, its 2,250km2 is home to a fascinating variety of flora, fauna, marine life (including Meditteranean monk seals) and unspoilt natural beauty. Finally, just across the water, is Alonissos's sister Sporades Island, Skopelos, which is highly recommended and easy to get to. Athens International Airport: 35-40 minutes to Alonissos by helicopter. "The owners were most hospitable. We felt the service went above and beyond. We usually travel independently and try to avoid any organised travel. This experience felt bespoke and actually was a very pleasant surprise." The owners were most hospitable and really added to our enjoyment of the villa. We felt the service went above and beyond. We usually travel independently and try to avoid any organised travel. This experience felt bespoke and actually was a very pleasant surprise. Jura was beautiful, truly stunning. Owners so friendly and helpful. We particularly enjoyed the many different sunny and shady areas of the villa to relax, all with fantastic views, and the beautiful walk down to the village. The beach below the villa was lovely. Definitely recommend the cook at the villa. The children said it was the best meal they’d ever had. Cleaners lovely and friendly. Jura was outstanding: views to die for, a perfect setting above Steni Vala. We loved meeting the owners, what a delightful couple and so welcoming, warm, engaging and interesting. Jura was beautifully designed. We really enjoyed the utter peace of Alonissos in early June. Nothing to do, which was bliss. Jura is a truly wonderful property - we felt we were in heaven - and the views in every direction were quite exceptional. Every possible need was thought of in the way the house had been designed and fitted out. Beautiful in all dimensions. The owners were the most amazing hosts and went above and beyond to ensure we had a fabulous holiday. I am sure we will we back! The gardens a Jura are really beautiful and the number of places to sit outside is great. The views and location so close the beach and tavernas is perfect. The owners of the villa were completely charming and we really appreciated their friendly welcome and huge number of delicious grapefruits supplied. Jura's a really nice villa in a perfect location. The two rooms upstairs are really sumptuous! The owners are really nice too. Plenty of decent tavernas in Steni Valli which is 5 mins away and the old Town (Chora) is really nice too. Alonissos is quiet but lovely and the helicopter journey well worth it for the look on their faces! We loved Jura. The owners were very friendly and helpful and gave us all the information we needed. Of all the holidays we’ve spent in Greece over 20 years, our stay on Alonissos was by far the best. Jura is, quite simply, perfect and occupies an exceptional position. The owners were excellent. Our holiday was a great success. De toutes les vacances que nous avons passées en Grèce depuis vingt ans, notre séjour à Alonissos a été de loin le meilleur. La villa Jura est tout simplement parfaite et jouit d’une situation exceptionnelle. Ses deux propriétaires italiens, Marco et Carlo, habitent à côté et ont été des hôtes très attentionnés et très sympathiques. Une grande réussite.